Another long, exciting PMC Week kicked off Monday evening (8/13) as Batz and I left Ranger Bar around 5:30 to pickup Lil Sorbo and Batz' girlfriend before our road trip could begin. I was kind of surprised at how well I did in the car so long, a much different story than back in February, when I was just miserable taking the red eye with my folks to Houston (and then Mexico) for my sisters wedding. We reached southern California around 11:00 and after stopping for lunch at In-n-Out Burger, it was on to Disneyland the rest of the day Wednesday, my first time back since spending a day there in 2006. Thursday we did California Adventure Park and Disneyland once more on Friday. Just before 6:00 I headed off next door to the Anaheim Convention Center and was glad I didn't make it much earlier after hearing how bad things had been with a very long, endless registration line (some apparently waiting as much as 5 hours) and the floor opening a half hour late. It only took me about an hour and a half to get my badge, enough time to check out the floor a bit and meet Claire Blackwelder (Kendall, Dino Charge) before No Pink Spandex Live started at 8:30. Afterwards, I got through the exodus leaving Disneyland to meetup with the gang again inside. 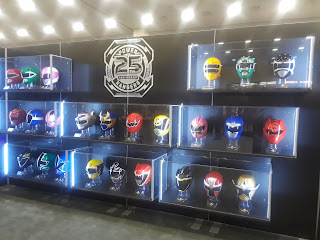 Saturday I saw Hasbro's toys presentation at 11:00, which I hoped would have something about next years Beast Morphers line but was mostly news about the Legacy Wars mobile game and a new HQ line of figures called Lightning Collection. Up next was the Ninja Steel Q&A and our Beast Morphers cast reveal with Instagram star/martial artist Jackie Scislowski quickly becoming my new Yellow Ranger crush. 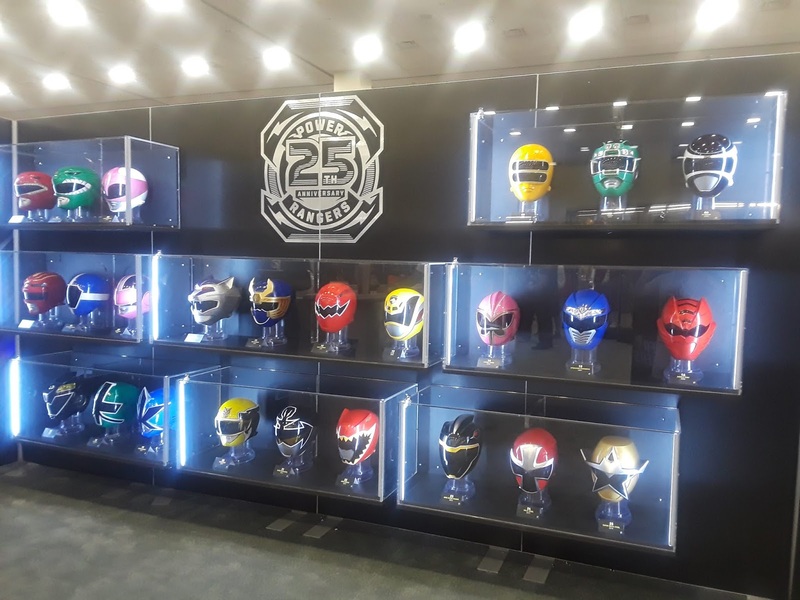 🙂 I stuck around for the Mighty Morphin 25th anniversary panel at 1:15 and grabbed lunch after. Back on the floor, I met Brennan Mejia (Tyler, Dino Charge) and Nikolai Nikolaeff (Dominic, Jungle Fury), right before the panel with a mix of Disney era cast (Operation Overdrive/Mystic Force/Jungle Fury). New to the convention scene, he was pretty cool and gave out posters to all of us at the panel before he would be heading out shortly. I then got busy meeting more PMC first-timers - Katrina Browne (Kapri, Ninja Storm), my original Power Ranger crush Katrina Devine (Marah, Ninja Storm & Cassidy, DinoThunder), and Adelaide Kane (Tenaya 7, RPM). Also said hi to Kelson Henderson, who played several supporting characters in the Disney era and returned for Ninja Steel. I don't read the Power Ranger comic books but without much else to do with the floor closing 6:00, I went to the Shattered Grid live reading and boy was it a good idea. Cast & voice actor alumni did the characters, including Barbara Goodson reprising Rita Repulsa and a cameo from Rita's henchmen Squatt. Zordon himself lived again as well, thanks to David Fielding and some special equipment - the greatest moment of the ENTIRE weekend. I metup with the gang after and it was time to start getting ready for the Angel Grove High School Prom '96 That Hashtag Show was putting on and the Ranger Bar Pink Dolphin Party in our hotel room for the night that would follow. Prom was fun and then our party got underway with a handful of folks coming to hangout including Christopher Khaymen Lee (Andros, In Space), dropping by with his posse later on. One of the last ones up, it was after 5am by the time everyone left and I called it a night (albeit a short one), while Lil Sorbo escorted a guy back. Sunday I saw the Yellow Rangers panel at 11:00 and then met Kevin Kleinberg (Trip, Time Force) and got a few things at JC's Henshin Vault booth. It was also pretty cool taking in RJ Cyler being there, the only 2017 movie cast member to appear at a PMC thus far. He had a very solid line the entire weekend, alongside Jason David Frank who was swarmed his only day there Saturday. At 2:00 I caught the In Space panel (This year being the 20th anniversary of that season) and then said hi to Caitlin Murphy (Ronny, Operation Overdrive), one of the first cast members I ever met at the original PMC. At 4:00 was a rather luckluster Bulk & Skull panel, with Paul Schrier joined by The Bruce and some kids on stage, after Jason Narvy had to catch a flight earlier. PMC then had a short closing ceremony, confirming a return to Anaheim in 2020 to closeout the weekend. Team Ranger Bar soon headed off to get dinner and then the journey back to Washington began. After stopping for lunch before noon on Monday, we dropped off Batz' girlfriend, Lil Sorbo and then myself, getting home around the same time we originally left Ranger Bar. As the convention continues to grow (setting a new attendance record this year), moving to Anaheim was definitely the right call, offering plenty of space on the floor including awesome displays of full suits and a wall of helmets to commemorate 25 years of the show from new owner Hasbro - a very exciting time to be having a PMC. I got off easier than others waiting in line to get my badge but pretty much anyone would say that have got to get things handled a lot better to avoid this mess happening again. Getting my gold membership perks and exclusives (shirts, hoodie, coins, pins, etc) went smoothly for me as well, waiting until Saturday afternoon, after the line had diminished. Navigating past actors tables still got tricky when people had lines but that's to be expected no matter the venue. I was a little disappointed by the lack of Dino Charge cast but was glad I got to talk to two out of the three who were there. With how poor Ninja Steel has often been, I don't plan on making them much of a priority next time, instead concentrating on recent cast I've missed (depending on who goes) and classic era almuni I keep missing or could repeat again after several years (2020 being the 10th anniversary of the first time it was in Pasadena). Also, it's still hard to top how likeable the Megaforce cast is off the show, the fun they have and talking to them all in 2016. Being next door to Disneyland was big as well - pretty hot for all the running around but fun seeing the attractions and experiencing some fun & crazy rides. We had a nice AirBnB for three nights too. Props to the team - Lil Sorbo, Batz for handling where we'd be staying and his girlfriend for fixing us breakfast a couple mornings.